A slight breeze blows through the open door of the Deep Vellum bookstore. The store is narrow, but the ceiling is tall and the shelves almost reach to the top. Two women sit at the front desk having a conversation over coffee as customers browse the shelves. Soft indie music sets the atmosphere, making it easy to get lost in the mountains of literature. 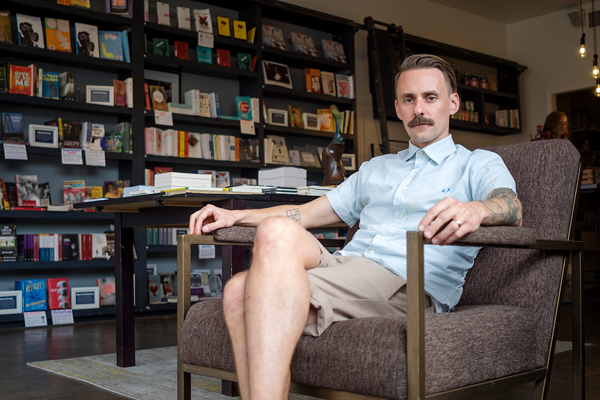 Will Evans, the founder of Deep Vellum Publishing and its bookstore, walks briskly inside and immediately and almost imperceptibly changes the atmosphere from a lazy Tuesday afternoon to a productive one. Evans stops talking long enough to walk over to a center display table and illustrates his point to Christina Rodriguez, the general manager, for letting a book block the view of another one. “Well, maybe that’s because someone was looking at that one and set it there,” Rodriguez replies. Evans walks over to the front desk and talks with his assistant Tanya Wardell. In spite of standing a couple inches shorter than his assistant, Evans’ personality and presence seems to fill the entire bookstore. Evans is not only a publisher and bookstore owner, but he’s also a literary translator. Originally from North Carolina, Evans said that his interest in translated literature stemmed from one significant moment. After reading Maxim Gorky’s “The Life of a Useless Man,” Evans became interested in Russian literature. When he got to college, he decided to take a course on 19th century Russian literature and translation and ultimately changed his degree to Russian culture. Then Evans was given the opportunity to be the tour manager of his friend’s band and manage the sale of their merchandise. He started working in the music industry booking bands, splitting five years between Los Angeles and Austin. He later decided to attend graduate school at Duke because it was closer to where his wife was attending law school. During the translation process he became aware of how few books were translated for publication in America. When reading the blog of Chad Post, the man who runs Open Letter Books, another independent publisher whose books Deep Vellum carries, Evans was inspired to start a publishing house and publish translated books. Wardell, who has been working with Evans for more than a year, first found out about Deep Vellum and its owner through an article that mentioned the publishing house and immediately she knew she had to be a part of it. Evans sees the current American publishing scene as a problem that can be fixed through publishing translated literature. Evans said translated literature can help readers find a connection with someone from anywhere in the world if only translation was more prominent. “When you read literature, not only does it develop the capacity for empathy as the reader, but it also teaches you different facts, histories and the way that other people from different parts of the world see reality,” Evans said. Evans’ goal of creating an interactive community around literature, translation and its authors is being realized. He signs international authors to Deep Vellum Publishing and translates their work through the American Literary Translators Association, a group founded at the University of Texas at Dallas in 1978 that specializes in literary translations. He then distributes these translations through Deep Vellum’s bookstore. As general manager, Rodriguez has a soft spot for the Deep Vellum titles and for Evans’ passion for the literary world. Not only does Evans translate books, sign authors and publish their books, he is also working on starting a book of his own. Charismatic and a little on the talkative side, Evans is carving out a stronghold for translated literature, from which he intends to change perspectives and change the world, and he’s doing it all right here in Dallas. This “editor” is a pretencious d-bag and should never write another story again.